Fantasy Mosaics 5 is rated 4.1 out of 5 by 20. Rated 5 out of 5 by zeldaqn from OMG a logic art game I haven't even played yet but know I'm going to love this. I will actually spend 8 dollars on a puzzle book just for the one logic art puzzle in it. I can't wait, I live for these puzzles. I"M SO EXCITED. Rated 5 out of 5 by A1psyko from What am I missing? This is Fantasy Mosaics 5 but when I list this game it is up to Fantasy Mosaics 7-Our Home. Why is it listed as NEW when it doesn't seem to be. Again, what am I missing? I love these games, they are a challenge and I even have the earlier versions on my Ipad so I can play them while traveling. Worth the cost because you can play over and over. Rated 5 out of 5 by franckp from Still looking for the beautiful images described by BF. I give it a 5 because it has to be rated in comparison to other games of this genre and it therefore deserves the 5. That being said, I wish there was a mode where there were no mistakes! You could click on any tile and change it to either blank, X, or filled in with whatever color you are working on. This way if you accidentally hit the wrong square (which I often do, but don't consider this an error), you could just click the square again to the correct setting. The challenge would actually be greater, because when you do make an actual error, you wouldn't realize it until you get to the end and things don't fit together properly. Then you would have to go back to find the error, or start over. The game would end when all squares are filled in properly. Alas, this is not the case and we must be happy with what we have, which is still very good. Remember, don't be a Reckless Rater just to become a Key Contributor, don't give fives just to be at the top to get more helpful votes. It's a disservice to other fishes and the devs who actually deserve the five stars. Rated 5 out of 5 by p2668 from Great Music Love the music. I play this game when I feel like a relaxing game to play, and really love the music. I really enjoy the ending part of this game, when you get to endless puzzles. They are really challenging which is nice for a change, and very addicting. Rated 5 out of 5 by dkd1962 from Fantastic I love this version. My only complaint is that you can't tell what your score for each level was in order to go back and improve your score. If there is a way, it isn't clear. The game itself is fantastic. I played on the Advanced mode. Rated 5 out of 5 by kim0530 from Superb Like Fantasy Mosaics 4, it continues with the collection of colorful mosaic puzzles. A first in its kind. Normally, I would use the hint button until I found out that when switching between colors, it helps. This time, you are building a garden. 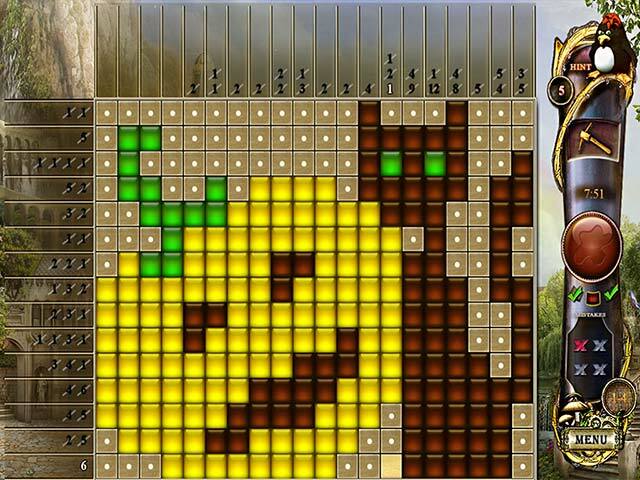 But what I love about this, it starts out on the second puzzle with a 15X15 grid not like the 5X5 like some games do. The artwork is exquisite and the music is soothing. Like the previous game, there's a challenge on some of the puzzles. But that's OK because for me a good challenge is what I'm looking. I'm not disappointed and is worth the money. 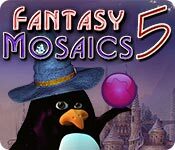 Rated 5 out of 5 by kjb46 from Best Mosaic game by a landslide I've been playing the Fantasy Mosaics games for quite a few years now, and prefer them to the other mosaic games. I fell in love with Fantasy Mosaic 4 as soon as it came out. I loved the addition of 3 different colors to the patterns, and I have played it so often I've pretty much memorized the completed pictures. I was so happy to see Fantasy Mosaics 5 offered that I bought it immediately. It is just as fantastic as game 4 was and I completely recommend it to everyone who likes the mosaic games. I sure hope they continue to introduce more games of this style. Rated 5 out of 5 by nufsober from ANOTHER CHALLENGE, ANOTHER WINNER!!!!!!!!! I'VE GOT ALL THE PREVIOUS FANTASY MOSAICS! THIS ONE IS JUST THE THING TO CONTINUE THE LEGACY!!!! WHAT AN EXCELLENT, YET, REST FULL WAY TO SPEND AN EVENING, IF YOU CHOOSE THE CASUAL CHOICE! CAN'T GO WRONG WITH THIS ONE! Rated 5 out of 5 by sunnyglow from A BIG THANK CYBER MONDAY THANK YOU TO BF FOR PROVIDING THESE LITTLE GEMS Our little penguin is back and this time you are going to decorate his garden. As you play the games, you complete his garden. This form of Sudoku has been called many names. Okay, you get to choose to name them what you want. Choose from O'ekaki, Nonograms, Pic-a pix, Paint By Numbers, or come up with your own name. I LOVE these games and to me, this is the best dev for producing these. They are colorized and once a row has been filled in either horizontally or vertically, it fills in the dots for the unused boxes. The grids go from 10x10 up to 25x25. A nicely done game dev! Keep them coming! Rated 5 out of 5 by pennmom36 from Brilliant Colors Fantasy Fantastic! The color combinations used are stunningly vibrant right from the get go, making this game one of the best Fantasy Mosaics yet. You can choose Casual which crosses off the numbers one by one or Advanced which crosses off the numbers when an entire row is complete. Just like the other Fantasy games, every step you take in the game will help renovate the penguins newest mystery garden with beautiful flowers and decorations. 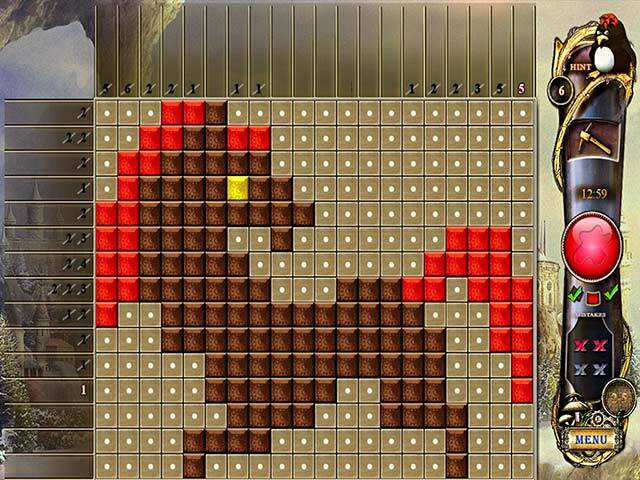 Mosaic games are based on logic so you won't have to be a math expert to enjoy these addicting games. You simply left click to mark a filled square and right click to highlight an empty square, if you have the numbers 2 1, this means that two squares will be filled in, followed by at least one empty square and then one filled in square. Every number must be separated by at least one empty square, and the grids vary in size, but you use logic to figure out which squares are filled in both rows and columns according to the numbers given. You are allowed up to three mistakes before you have to restart that level, the penguin will give you two hints per level on a random filled square and there is a pick axe you can use to reveal the state of any square. 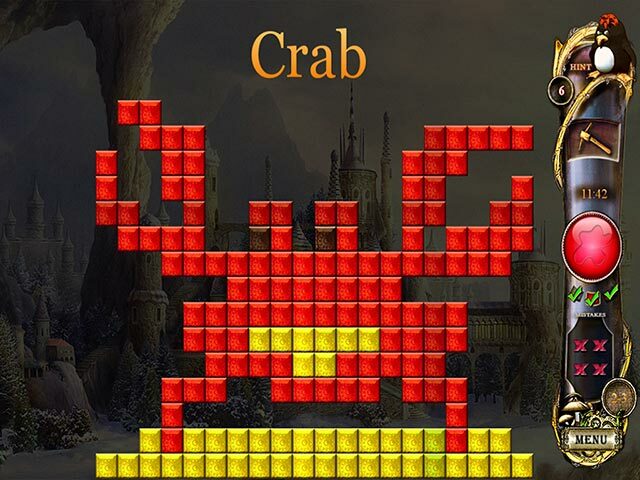 You will start out the puzzle in one color, and once all squares have been filled in with that color, the next color will automatically be displayed, however, if you get stuck, switching to another color may help you solve the puzzle so I suggest you try a different color before using up your available hints, enjoy!